PR departments are just not good at keeping secrets – an English language page was posted to Samsung Indonesia that extolled the benefits of the “maxed out notchless Infinity screen”. 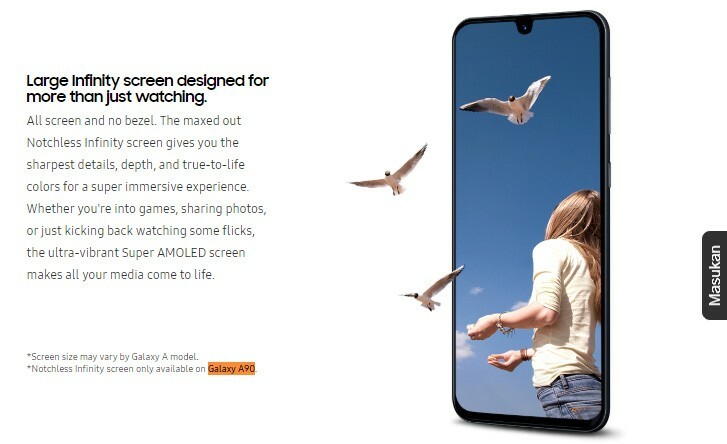 However, the page makes it clear that this feature is available only on the Samsung Galaxy A90. “Notchless” doesn’t necessarily mean that the Galaxy A90 will opt for a punch hole selfie camera like the Galaxy S10 flagships. Previous leaks suggest that it could be come Samsung’s first phone with a pop-up camera. The image accompanying the text is clearly of another A-series phone. There are strong indications that the Galaxy A90 will be the star of the show at the April 10 event focused on the A-series. I'm very excited to see this kind of a phone.. Yet not done doesn't mean impossible to be done, the design just didn't get miniaturised but already exists, , maybe Samsung is already one step ahead of what is already known.. time will say!